If you have a series of drug tests coming up (or if you aren’t sure which type of drug test you’ll be required to take), we offer the All In One Value Pack so you can save some cash but still get everything you need to pass the most common types of drug tests. 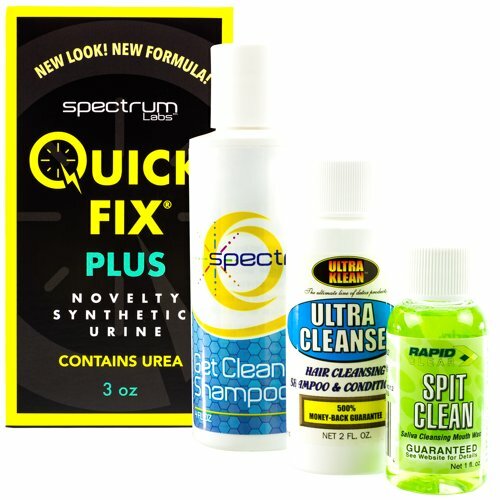 The All In One Value Pack comes with one bottle of Quick Fix Plus Synthetic Urine, one bottle of Get Clean Shampoo, one bottle of Ultra Cleanse Detox Shampoo, and one bottle of Rapid Clear Spit Clean. With this value pack, you’ll be able to pass a urine drug test, hair drug test, and saliva drug test with ease! Quick Fix Plus Synthetic Urine is exactly like human urine, it’s just been created in a lab rather than the human body. It’s complete with urea, uric acid, creatinine, and vitamins. Plus, it even has the same pH balance and specific gravity (density) of the urine your body naturally produces. Even laboratories use it for helping them calibrate their urine testing equipment, so you can be sure that Quick Fix is as close to real pee as you can get! But, since it’s guaranteed to be completely toxin-free, you can use it as a substitute for your own whiz and pass your urine drug test! Ultra Cleanse Detox Shampoo gets deep into your hair strands and extracts any drug toxins from your hair. When you use drugs, some of the drug toxins left in your bloodstream end up bonding with your hair as the strands are forming. Normal shampoo won’t do the trick, but Ultra Cleanse is a very special detoxifying shampoo that actually removes unwanted toxins from within the hair strands themselves. Use this with the included Get Clean Shampoo and you’ll be golden! Get Clean Shampoo is actually more of a leave-in conditioner. When applied properly, it will mask any leftover drug toxins that may be present on or in your hair. Ultra Cleanse is guaranteed to get the job done, but when it comes to keeping your private life private, we recommend using the Get Clean Shampoo as well - just to make sure you’re doubly covered and able to pass your test easily. Rapid Clear Spit Clean is a detoxifying mouthwash that you can use to help you pass a spit/swab/saliva drug test. Just swish with half the bottle for a few minutes, spit, and repeat. After that, your mouth will be free of all unwanted drug toxins for 30 minutes and you’ll be able to spit clean on your saliva drug test! For those needing an all-in-one solution, this bundle is the perfect option. You’ll get 4 great products specifically designed to help you pass the most common types of drug tests - plus, you’ll save a decent chunk o’ change by bundling them all together!